Definition at line 214 of file process.h. Definition at line 54 of file process.h. Definition at line 354 of file process.h. Definition at line 22 of file process.h. Definition at line 24 of file process.h. Definition at line 21 of file process.h. Definition at line 23 of file process.h. Definition at line 25 of file process.h. Definition at line 219 of file process.h. Definition at line 435 of file process.h. Definition at line 437 of file process.h. Definition at line 433 of file process.h. Definition at line 436 of file process.h. Definition at line 434 of file process.h. Definition at line 432 of file process.h. Definition at line 438 of file process.h. Definition at line 439 of file process.h. Definition at line 29 of file thread.c. Definition at line 55 of file gs_support.c. Referenced by mainCRTStartup(), and WinMainCRTStartup(). Referenced by init(), main(), runProg(), ServiceMain(), StartDefragThread(), test_thread_handle_close(), WndProc(), and xmlGetGlobalState(). Referenced by clnt_vc_create(), CIconWatcher::Initialize(), InitProgressDialog(), nfs41_delegation_recall(), nfs41_session_set_lease(), OpenPropSheet(), pattern_fork(), CDeviceView::Refresh(), ServiceStart(), SHChangeNotifyRegister(), START_TEST(), StartWatchGUI(), and test_thread_handle_close(). Definition at line 17 of file _exit.c. Definition at line 7 of file _exit.c. Referenced by __declspec(), and exit(). Definition at line 95 of file thread.c. Referenced by DefragThread(), init(), processRequest(), test_thread_func(), and test_thread_func_ex(). Referenced by ActionThread(), and test_thread_func(). Definition at line 7 of file procid.c. Referenced by test_file_inherit(), and test_pipes(). Referenced by shell(), and ShellCmd(). Referenced by Jobs(), RunBatch(), and RunBookmarkEditor(). Referenced by fork_helper(), Jobs(), RunBatch(), ShellCmd(), subprocess(), and system_icmp(). 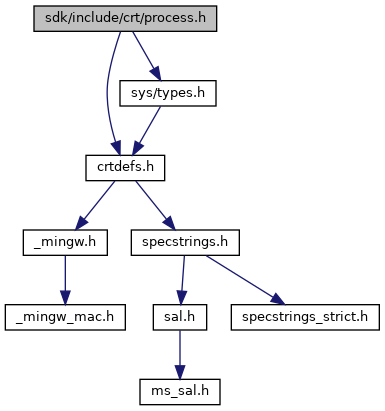 Referenced by adns__vdiag(), CloseTrace(), generate_random(), getexecpath(), getkeyserv_handle(), IcmpSendEcho(), main(), mkstemps(), OpenControlConnection(), OpenTmpBookmarkFile(), OpenTrace(), PreInit(), rpc_call(), RunBookmarkEditor(), SavePrefs(), ServeOneClient(), Server(), SpoolName(), SwapBookmarkFiles(), WaitForRemoteInput(), and WaitForRemoteOutput(). Referenced by acpi_system_add(), acpi_system_remove(), check_directory(), chmc_init(), chmc_system_done(), copy_file(), create_cache(), DisplayOutput(), DumpFont(), HaveSpool(), InteractiveConsole(), InternetCheckConnectionW(), is_default_metric(), main(), telCommandLine(), Test_ImageSection2(), test_PdhValidatePathExW(), test_PdhValidatePathW(), test_system(), unpack_iso(), and xsltGetHTMLIDs(). Definition at line 49 of file gs_support.c.